I'm pretty sure the expression referring to someone being "the light of our lives" must have been coined by some doting grandparent! With my treasured writer friend, Theresa Nelson. Our paths crossed twenty-nine years ago when our early books, And One for All and Children of the River, were reviewed together in the San Francisco Chronicle. I wrote Tess a letter, she wrote back, and the rest is history. And this was before email! She was often on the road with her actor husband, Kevin Cooney, and had to write entirely by hand. Although we've only actually been together a half dozen times over the years, her support and encouragement in writing and in life have meant the world to me. "It is not often that someone comes along who is a true friend and a good writer." E. B. White. People who know me and my family will recognize many details taken from real life in my fiction, but Wedding in Yangshuo contains only true details about my childhood, how I ended up being a writer, and how I married the man I did. Thus, it belongs right here, front and center on the Biography page. Resurfacing recently, this wallet-worn old scrap of a photo shows my husband and me on an early date in the politically eventful spring of 1970. (Remember Kent State?) We had only recently met at Lewis & Clark College. I'm nineteen here; Herb's twenty-one. My uncle, Bill Welch, who lived in Portland, took us out on his sailboat on the Willamette. I remember feeling proud I had such a cool uncle, and I hoped it was giving me a little cred with this guy I'd been smitten with ever since I sat down opposite him in the cafeteria and decided he was the cutest thing I'd ever seen. Reclining against my future husband that balmy May evening, gliding over the water, I think I already knew this guy was the one for me, even if he did officially have another girlfriend at the time. It required an amazing and almost magical series of real-life plot twists before we were married four years later, but they say people who stick together treasure their stories, and I certainly treasure mine. 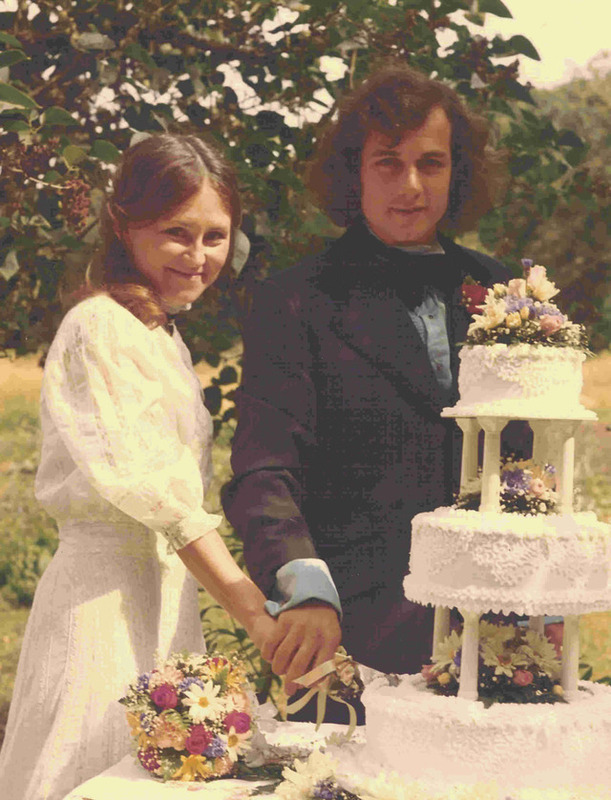 We were married right here at Wake Robin Farm, where we still live all these years later. The other day I was reading a line I wrote toward the end of my book, A Heart for Any Fate, where Lovisa is pointing out to Rowland that the two of them really ought to get married, seeing what a good team they'd become, having made it to Oregon in a covered wagon with her sister's children. I wrote this long before I ever fell into the pit of addiction to prescribed drugs, the challenge of my life, but I could have been writing about us, surviving this ordeal together: We got here. And nobody but the two of us would ever know exactly what that meant. Or all that we'd been through together. We installed this plaque last year on the fallen trunk of the oak tree under which we were married in 1974. What you can do, or dream you can, begin it! BEGIN, and then the work will be completed.